Family fashionistas Pearl and Daisy Lowe took to the catwalk for a mother and daughter fashion show over the weekend, strutting their stuff on the catwalk at Goodwood’s Vintage festival. SEE MORE GOODWOOD SNAPS HERE! The pair were taking part in the Soundtrack of our Lives fashion show at the vintage festival, and stepped out in a range of different creations, showcasing Pearl’s range for budget brand Peacocks, and Daisy’s collection for French fashion house, Morgan. 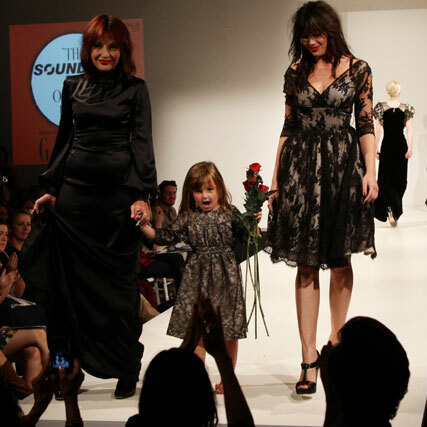 Mum and daughter sashayed down the catwalk hand in hand, before being joined by a much smaller member of the family – Pearl’s four-year old daughter Betty Goffy. Dressed in a pretty lace frock, the tiny tot took to the catwalk with her mum and half-sister, carrying a red rose and grinning for the cameras. And looking pretty as a picture, Daisy couldn’t hide a smile of her own. But the lucky lovely had another reason to grin for the cameras. The star was being cheered on by her actor beau, Dr Who star Matt Smith, who proudly looked on from the front row. Looking oh-so-chic in a checked shirt and dark aviators, the stylish actor clapped and cheered as his girlfriend took to the catwalk, congratulating her with kisses as she stepped off stage at the end.